23 hours to go. 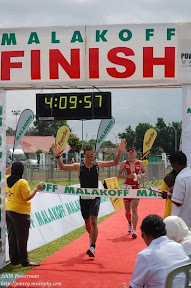 This is my 2nd triathlon race this year and my 5th Panaga Triahtlon race. I've not prepared much for this competition since it is overlapping with the Xterra triathlon training. So I guess this is just a pre warm-up for the Xterra. The format of the competition is the same as last year that is 500m pool swim (16 laps), 24km cycle ride (3 laps) and a 5 km run (2 laps). So guys and gals, please remember IT IS A 3 LAPS BIKE RACE NOT 2 LAPS. THIS IS DUE TO ROAD CLOSURE. Yesterday, I received an email from the Panaga Triathlon saying that the Panaga pool is closed down until further notice due to technical problem. So, if the pool is still closed on Sunday, the event will be changed from Triathlon to Duathlon (run-bike-run). I guess most of you competitors have also received the same email as I do. But for those who have prepared intensively for the triathlon especially the swimming part, i felt sorry for them. They have trained very hard. Swimming every lunch time and after work, makan minum tidur di swimming pool (nasi tambah)..hahahahha. urang POWERMAN laju ni.. bulih manang ni.. There goes my training down the drain haha. But Duathlon atu layan jua but lambat pulang tu. alum ada harapan selagi ada orang orang laju ikut.....GO Ahmad!!!! I emailed to Panaga this morning regarding the Tri/Dua ani. We need confirmation..